Samsung’s currently rolling Android 8.0 Oreo out to Galaxy devices, but it looks like the company could release Android 8.1 Oreo in a few weeks. As we push into the summer, Samsung’s Android 8.0 Oreo/Experience 9.0 UI roll out is picking up steam. The Galaxy S8 Oreo update’s widely available, the Galaxy Note 8 Oreo update’s making progress, and the Galaxy S7 Oreo update is finally pushing out to users in the United States. Samsung’s promised a steady stream of Android 8.0 Oreo updates throughout 2018 and those of who haven’t gotten bumped up from Android Nougat should be on the lookout for the upgrade as we press on into the year. The company’s Oreo update is currently based on Google’s Android 8.0 software and includes its own Experience 9.0 user interface. We don’t expect that to change in July. That said, there’s a chance Samsung deploys a newer version of Android Oreo in August or sooner if we’re lucky. Last year Google released a newer version of Android Oreo dubbed Android 8.1. Android 8.1 is still the most up-to-date version of the operating system and companies like OnePlus have pushed it out to their devices. As Samsung’s Oreo roll out picks up steam, and as rumors start to emerge, there will be questions about the company’s plans for Oreo and Android 8.1. Today we want to help answer some of those questions as we outline what we know, and what we think we know, about a potential Samsung Galaxy Android 8.1 Oreo update. Android 8.1 Oreo was first released for Nexus and Pixel devices in December, 2017. Since then, Google’s released several new Android 8.1 builds with additional security patches and bug fixes. The Android 8.1 update is a maintenance release, but it comes with some additional features (like speed labels for open Wi-Fi networks), some of which could come to Galaxy phones down the road. Either in new Android 8.0 builds or in an Android 8.1 update. For more on Android 8.1 and its changes, take a look at our walkthrough. Samsung hasn’t confirmed plans to release Android 8.1 for Galaxy phones and tablets, but the first Galaxy Android 8.1 update is reportedly in development alongside upgrades to Samsung’s Experience UI. According to Galaxy Club, Samsung is testing the Android 8.1 Oreo update on the Galaxy Note 9. The update’s shown up in a benchmark for the United States-bound model known as the SM-N960U. Samsung’s confirmed plans to launch the device on August 9th and it looks like it could arrive with Android 8.1 Oreo rather than Google’s new Android P operating system. It also looks like the company is planning to launch Android 8.1 on a couple of other devices including its new Samsung Go smartphone. The device has been certified at the Wi-Fi Alliance running Android 8.1. This certification is a necessary step ahead of launch and could mean that a launch is imminent. The company is also working on an updated version of the Galaxy Tab A and the device has appeared in a benchmark running Android 8.1 Oreo. The new Galaxy Tab A appears to be a modest upgrade and it looks like it’s heading to carriers in the United States including Verizon. A launch date isn’t known, but the device recently passed through the Wi-Fi Alliance, a sign that an official announcement is getting close. Last year Samsung launched the Galaxy Note 8 with Android 7.1.1 Nougat, the first Galaxy device with something other than Android 7.0 Nougat. The Galaxy Note 8 launched in August and all signs point to a Galaxy Note 9 release in August ahead of Apple’s rumored iPhone 11 release date in September. 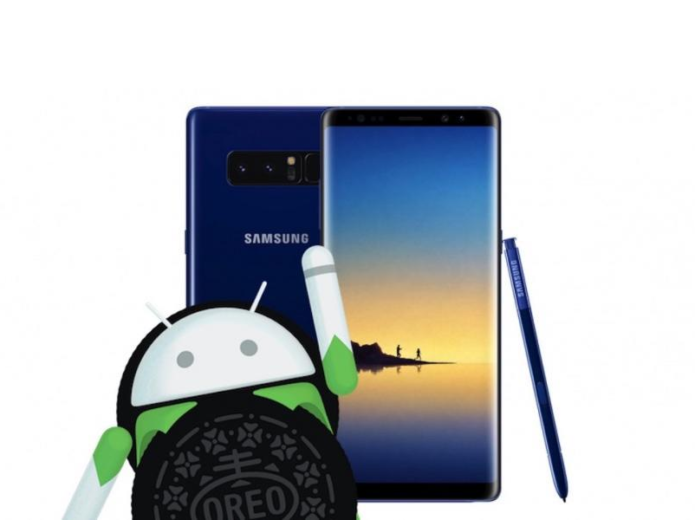 With Samsung Go and Galaxy Tab A 2018 announcements coming soon and the Galaxy Note 9 launch planned for August, it looks like Android 8.1 Oreo will arrive sometime in the next few weeks. While the Galaxy Note 8 launched with Android 7.1.1 Nougat on board, many popular Galaxy devices stayed on Android 7.0 Nougat. After the Galaxy Note 8 release, Samsung upgraded devices like the Galaxy Tab A 9.7 and Galaxy J5 (2016) with Android 7.1.1 Nougat. However, these devices moved up from Android Marshmallow. Devices that were already running Android Nougat stayed on Android 7.0. If Samsung follows the same protocol this year with Android 8.0 and Android 8.1, we could see devices move up from Android Nougat to Android 8.1 later in the year and devices like the Galaxy S8 and Galaxy Note 8 stay behind on Android 8.0. Samsung probably won’t say much about its plans so keep an eye out for rumors and additional Android 8.1 benchmarks as the year goes on. There’s no guarantee Samsung will roll out an official version of Android 8.1, but that won’t prevent you from getting it on board a Galaxy device. There are already ways to get Android 8.1 on Galaxy phones right now and we should see more unofficial Oreo ROMs emerge throughout the year. If you get sick of waiting around for Samsung, and again it could be months before we see an official release, you’ll need to take advantage of unofficial software.